"NearGrass: (nir' gras) adjective 1. A musical style (or genre) consisting of an eclectic smashup of Bluegrass, County, Folk and Americana styles, using mainly acoustic and traditional instruments"
The Palmetto Rose Band sprang forth from the musical traditions of the South Carolina Lowcountry. 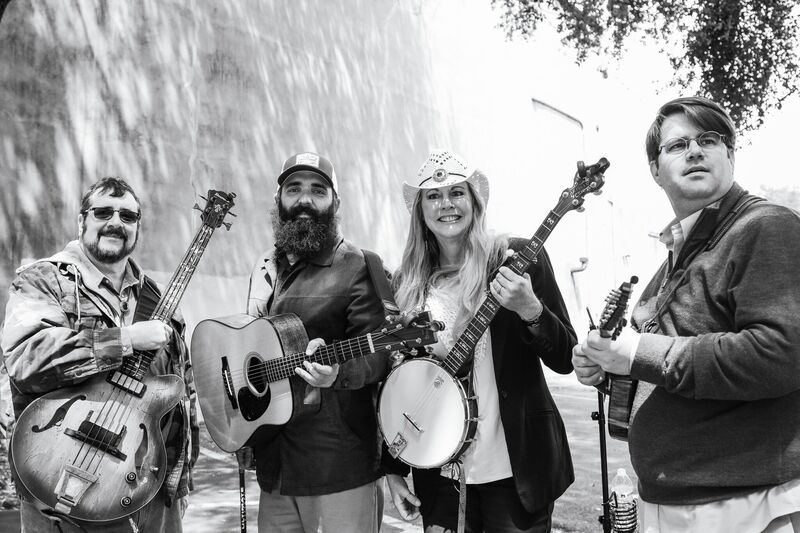 Originally started as a traditional Bluegrass band nurtured by the artist owners at Hungry Monk Music, the band has absorbed and integrated many complementary styles and genres. Difficult to describe, but always easy to enjoy; the band will delight you with songs from the worlds of Bluegrass, Country Folk and Americana traditions as well as some catchy original music. The primary musical line up consists of Nicole on lead vocals, banjo, Jeff on Bass and vocals, Donald on mandolin and guitar, and Ryan on guitar and vocals. The songs feel immediately recognizable and make you want to sing along as well as think, and relate to the lives and the stories the songs tell. Their music has been described as informal as “a comfortable pair of jeans”, and yet respectful of the origins and roots of the music they play. Whatever your tastes in acoustic music, we’re sure you will find something to enjoy with the Palmetto Rose Band! Please contact us (using the contact tab) for information about playing your next event). We do events of any size including stage based, private parties, Farmers Markets and outdoor festivals. We believe in giving back to the community and are happy to discuss your charity event. The Palmetto Rose is a tradition unique to the South Carolina Lowcountry and Southern Coastal regions. 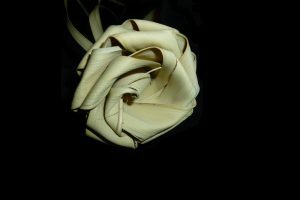 The Palmetto Rose is a hand woven flower made from the fronds of South Carolina’s official tree – the Palmetto tree. There are many stories about the origins of the Palmetto Rose, which is thought to go back to Civil War times. One tradition holds that southern ladies would make and give a Palmetto Rose to their lovers to keep them safe during the war. Eventually, the Palmetto Rose came to symbolize eternal, everlasting love. They are still lovingly made in the South Carolina Lowcountry, and still symbolize the blending of nature and love. © 2019 Palmetto Rose Band. All Rights Reserved.